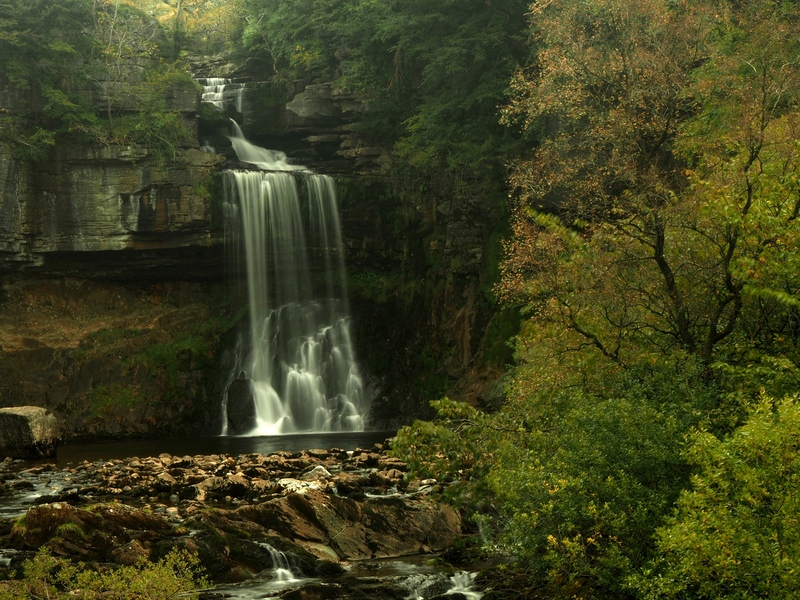 The classic Ingleton Waterfall Walk, a walk that may be short on distance but as its name suggests features some fantastic waterfalls. Ever since I first did the Ingleton Waterfall Walk with my mum when I was about nine years old it has been a favourite of mine. As a short walk packed full of features I thought it would be a nice one to take my work colleagues on for our first outing together since we did the Yorkshire Three Peaks Challenge Walk back in July. The only downside to the walk is the cost. At £6 per adult the total cost for the group was £36 which I think is a bit on the steep side. It can also get very busy but thankfully when we arrived there were not too many cars. Within minutes of leaving the car park we were already in the limestone gorge of Swilla Glen. On any other walk this section would be a highlight but on this one it is merely an apperetif. After just over a mile we came to Pecca Bridge and a view of the lower section of Pecca Falls, the first of many waterfalls encountered on the walk. In quick succession we passed the Pecca Twin Falls and then the lovely Hollybush Spout. Shortly afterwards some of the group stopped at the handily placed snack bar for a coffee. While they refreshed themselves I walked a few minutes further on up the path to reach Thornton Force, the highest and most visually impressive of the waterfalls encountered on the walk. By going ahead it gave me plenty of time to set my tripod up and take numerous photos of this magnificent spectacle from a number of angles. After the rest of the group caught up with me we climbed the steps above the waterfall and followed the path round to a footbridge crossing the River Twiss. Leaving the latter behind we took the track heading south-east to Scar End and then, after crossing Oddie’s Lane, to Beezleys. From Beezleys we dropped down to the River Doe and the next set of waterfalls. At Beezley Falls we were entertained by a group of young men plucking up the courage to jump into the pool below the waterfall. They must have been confident about the depth of the pool and it is certainly not something I would have done. Passing Triple Spout (which was missing one of its spouts) and then Rival Falls the path followed the river closely until it entered the spectacular Baxenghyll Gorge. Following the path up above the gorge we made the small detour down to the suspension bridge which gives a quite stunning view down into the dark depths of the gorge. Next up was the viewing spot for Snow Falls, the final waterfall on the walk and one which it is unfortunately not possible to get too close to. Not long after Snow Falls we crossed the river on a narrow footbridge for an easy walk back into Ingleton where we treated ourselves to tea and cake in Bernies Cafe.